YOKOHAMA, JAPAN--(Marketwire - Nov 2, 2012) - China Star Optoelectronics Technology (CSOT), a business group of TCL Corporation, unveiled its newly developed product -- the 55-inch 4X full HD LCD screen -- for the first time at the FPD International 2012, an industry-renowned global platform that showcased the most advanced technology and future lifestyle trends. The launch ceremony was held at the opening day, which impressed the guests of the show and signified a great step forward for China's display technology era as well as a historical breakthrough for China's video industry. It also changed the status of China's long-term dependence on importing large LCD TV panels. A key highlight at the FPD International 2012 -- the 55-inch 4X full HD LCD screen, is another major innovative breakthrough for CSOT since its development of the "China Star." The product integrates multiple advanced technic including its self-innovating HVA technology, 4K2K Ultra High Resolution, 5.0mm narrow bezel, green energy-saving LED-backlight design and a high transmission rate. The 4K2K Ultra High Resolution technology presents a powerful expression of vivid three-dimensional picture quality. At half the size of similar products, the 5.0mm narrow bezel exemplifies the highest level of technology within the industry. 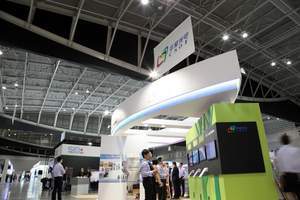 Through the release of its 55-inch 4X full HD LCD screen, CSOT has reinforced its leading position in China's panel display industry as well as demonstrated its potential as a highly innovative world-class enterprise. At the FPD International 2012, CSOT also showcased its comprehensive product line including its 28-inch, 32-inch and 37-inch HVA products, 46-inch SG 3D, 48-inch SG/FPR 3D products and the world's largest 110-inch 4X full high definition 3D LCD screen -- the "China Star." Just half a month ago, CSOT's 8.5G LCD panel production line had reached full capacity ahead of schedule at 108,000 sheets per month, setting a new milestone for China's LCD panel industry. According to the latest Display Search report, CSOT's product shipment volume in September 2012 has surpassed that of SHARP Corporation to become the fifth highest in the world, achieving a 9.5% global market share. This is on top of CSOT becoming the second largest LCD panel supplier in the China market. Mr. Chen Liyi, Acting CEO of CSOT, said, "Realizing the full capacity of the 8.5G LCD panel production line as well as developing the industry-leading 55-inch 4X full HD LCD screen and the 'China Star' all demonstrate CSOT's capability in research and independent innovation. We have performed well in patent technology, having submitted a cumulative total of 1,684 applications with 273 authorized to date. We will further increase our R&D investments to strengthen our leading technology capability and solidify CSOT's competitive edge on the international platform." The success of CSOT has enabled TCL Corporation to become the first company in China to produce LCD TV sets all by itself, promoting closer upstream-downstream cooperation and enhancing related industries. These achievements also strengthen China's position as the third country to have successfully developed high-end display technology, just behind Japan and South Korea. With the production of LCD panels now focused in China, TCL will play a more important role in the global market, continuing to drive the entire domestic panel industry to break the past international bottleneck and boost the overall competitiveness of China's color TV industry in the future.